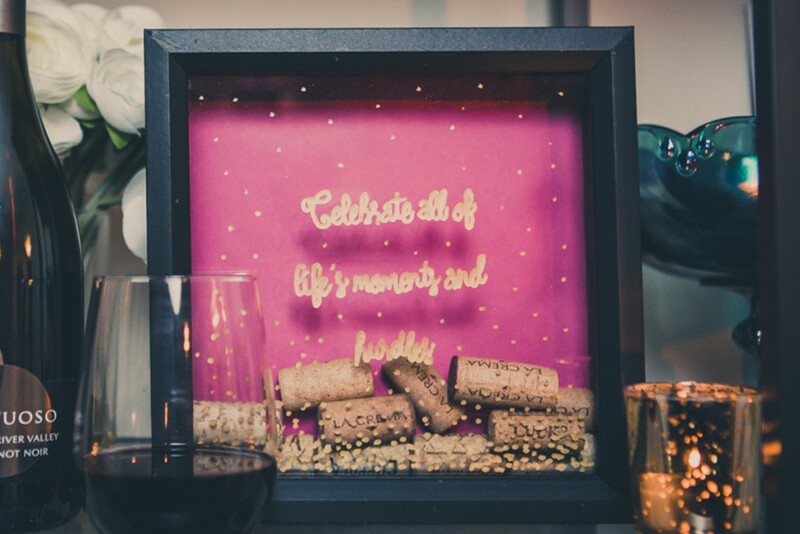 One of the traditions we have in our home is to save the corks from bottles of wine we have enjoyed when celebrating special occasions. 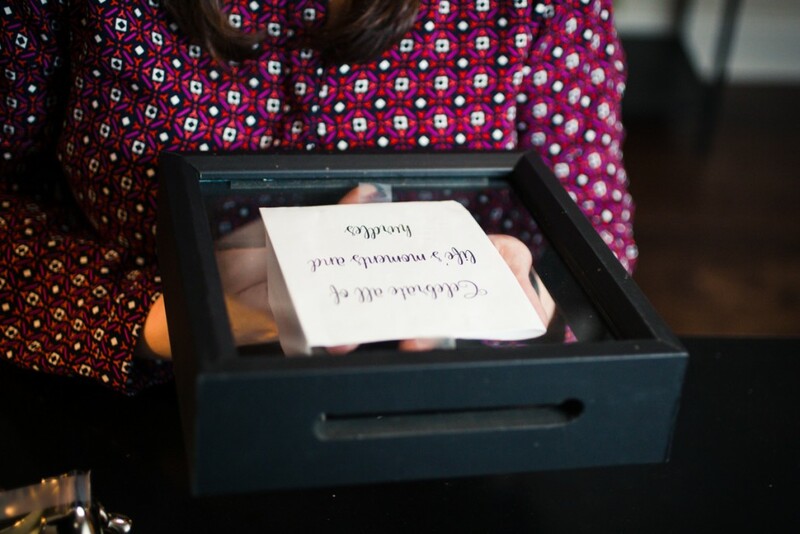 We always write the event and the date on the cork and then throw it in a drawer in the kitchen…until recently, that is! 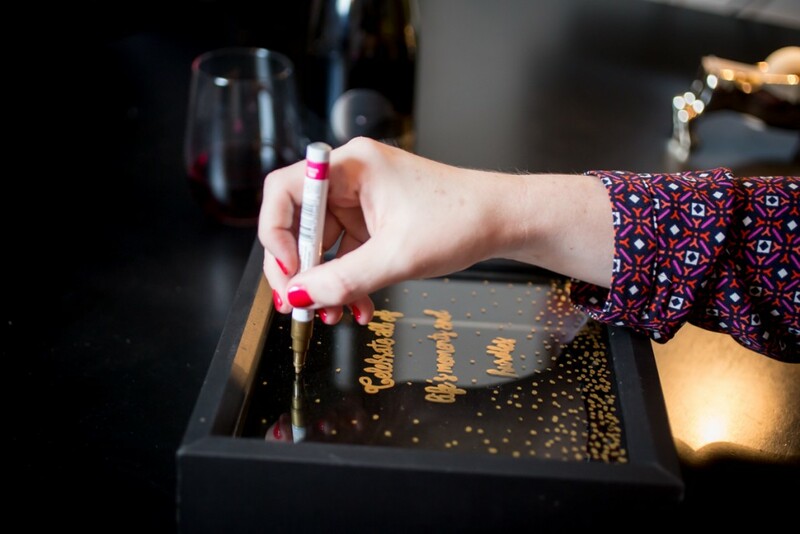 I made a this quick and easy DIY cork display box for all of our special corks, and so can you! Photo courtesy of Janet Howard Studio. I picked up an inexpensive black shadow box from the local craft supply store and chose a bright pink cardstock to line the back. Then, I downloaded a free, pretty font from www.dafont.com (you can also do a Google search for free fonts to find additional resources) and printed out the quote I wanted to use. I removed the back of the shadow box and glued the hot pink cardstock to it, so that the pink would show through the glass. Then, I centered my quote and taped it to the glass, but on the side that will be inside the shadow box. 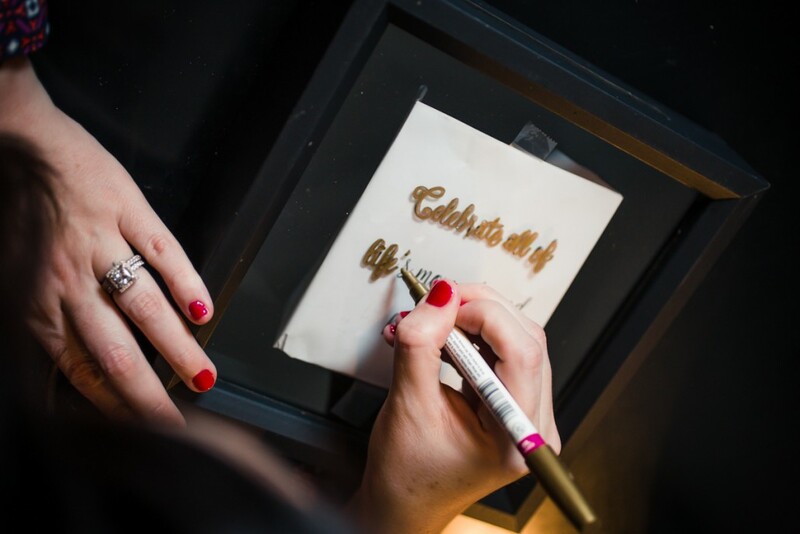 Using a metallic paint pen specifically formulated for glass and other smooth surfaces, I simply traced over the script directly onto the glass and then removed the paper when I was done. I thought it could still use a little something, so I added a confetti effect by placing sporadic dots all over the glass, gradually concentrating them more and more as I reached the bottom of the frame. La Crema’s Statement Maker Series helped inspire my quote because I think it’s important to remind yourself of great memories and challenges since that’s what life is all about! 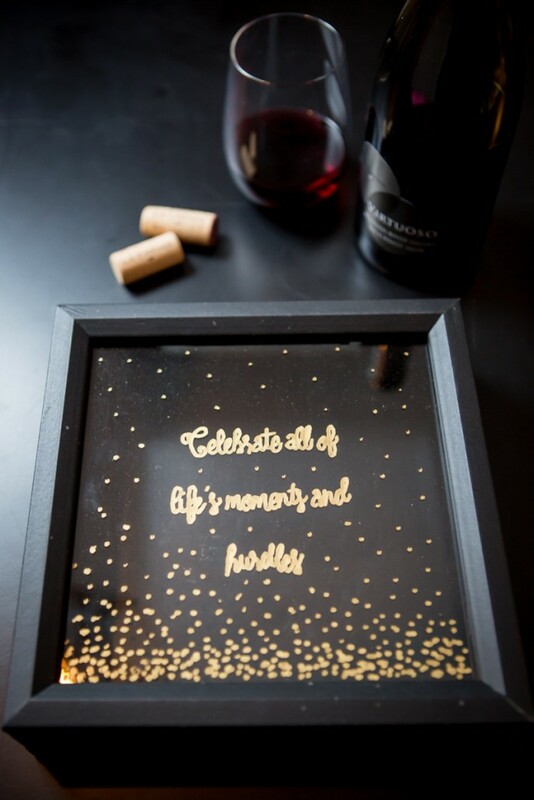 The quote I chose for my DIY cork display is “Celebrate all of life’s moments and hurdles.” As I filled my shadow box with our cork collection and read the memories scrawled on each one, I realized just how fitting it was. 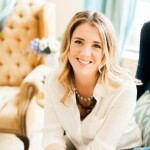 There were special moments — holidays and birthday celebrations and the like — but there were plenty of hurdles represented in that shadow box, as well. The last final I ever took in law school and passing the Bar exam to name a few! 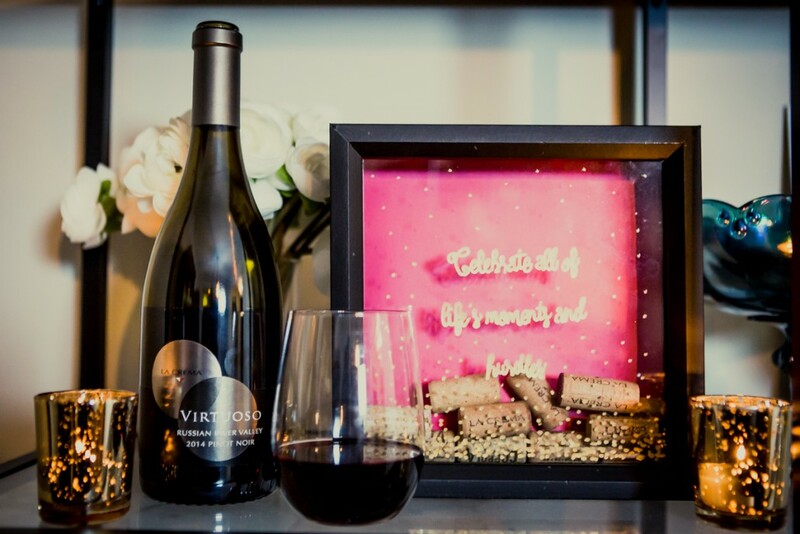 I popped open a bottle of La Crema’s delicious Russian River Valley Pinot Noir to celebrate my new DIY cork display, because even life’s smallest accomplishments deserve a celebration! Refined. Rich. Elegant. Made of fruit from our own backyard, a regional blend of complex flavor profiles that highlight the best of Russian River Valley.